Cascina Cà Rossa is located in Canale, in the heart of the Roero, known in the past for its fruit cultivation, today better known as one of the most important wine producing areas of Piedmont. The winery was founded in 1967 when Alfonso Ferrio bought a Cascina (farmhouse) that was called “Cà Rusa”, in Piemontese dialect “red house”, because it was built of red brick. The 1960’s was a period in which many farmers moved to the cities in order to find stable work, but Alfonso, with his ties to the land, continued with his cultivation of peaches, hazelnuts and a small quantity of wine (Arneis, Bracchetto, Nebbiolo, Barbera) that was sold in bulk. In 1992, on his son Angelo’s insistence, they began bottling some of their Arneis and Brachetto wines under their own label. The generational conflict that soon developed however was not easy. Father and son had different ideas on how to “optimize” production. Alfonso, who had grown up selling fruit by weight, could not bear the idea of cutting off ‘perfectly good grapes’ to improve the flavor. It was not until 1995 that Angelo, building on the farming skills he had learned from his father, managed to start shifting the focus in the vineyard from production quantity to quality. In 1996 he bottled his first Roero Audinaggio Valmaggiore, a Nebbiolo aged in small oak casks (barriques), which would become the Cascina Ca’Rossa calling card. Building on that success and recognition, a decision was made to upgrade the barbera produced from the Mulassa vineyard with a period of ageing in wood, creating their first Barbera Superiore. In 1998 the Mompissano vineyard, one of the best locations in the entire Roero for sun exposure and slope, was acquired and planted with nebbiolo, leading to the creation of the Roero Mompissano Riserva. In the following years, having proven the value of the focus on quality, Angelo was able to introduce more changes. The winery was modernized with stainless steel temperature-controlled tanks. French oak barrique and Slavonian oak large barrels were introduced, selected for their ability to enhance the delicate notes of the Nebbiolo grape during the ageing process. Today the winery owns 16 hectares and produces almost 100,000 bottles of wine under nine different labels. 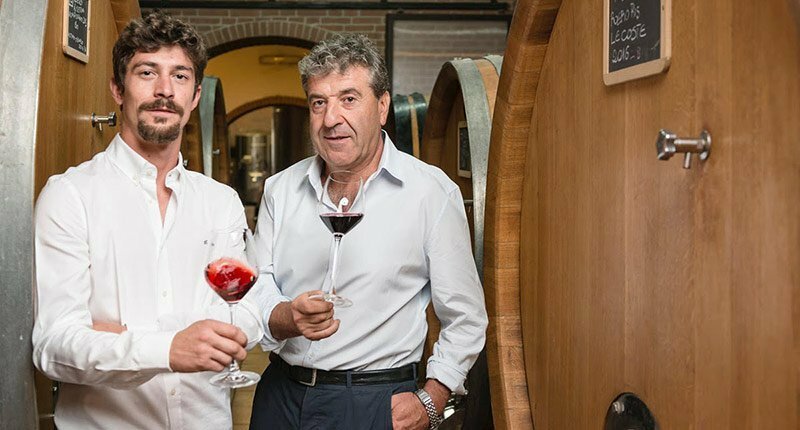 In 2012 the Organic Certification was awarded, another significant milestone for Cascina Cà Rossa, and Angelo was joined in his work by his son Stefano, a recent graduate of the enological school in Alba. Together, father and son continue what Alfonso began, with a blend of tradition and innovation.